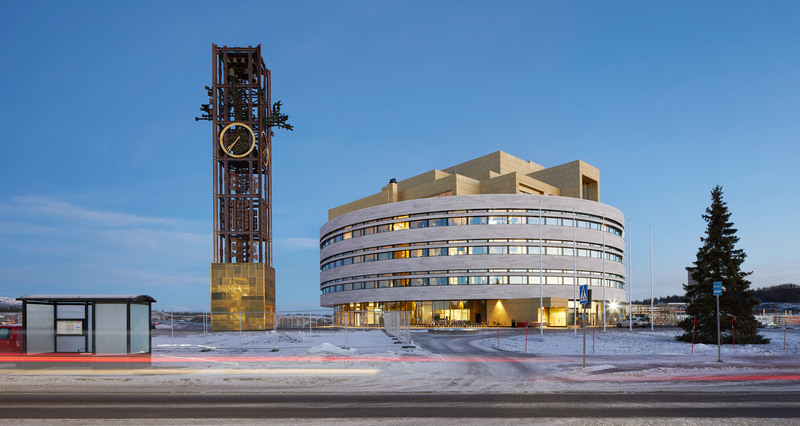 Kiruna Town Hall, designed by Danish studio Henning Larsen, is the first building completed as part of the £1 billion relocation of Sweden’s northernmost town. 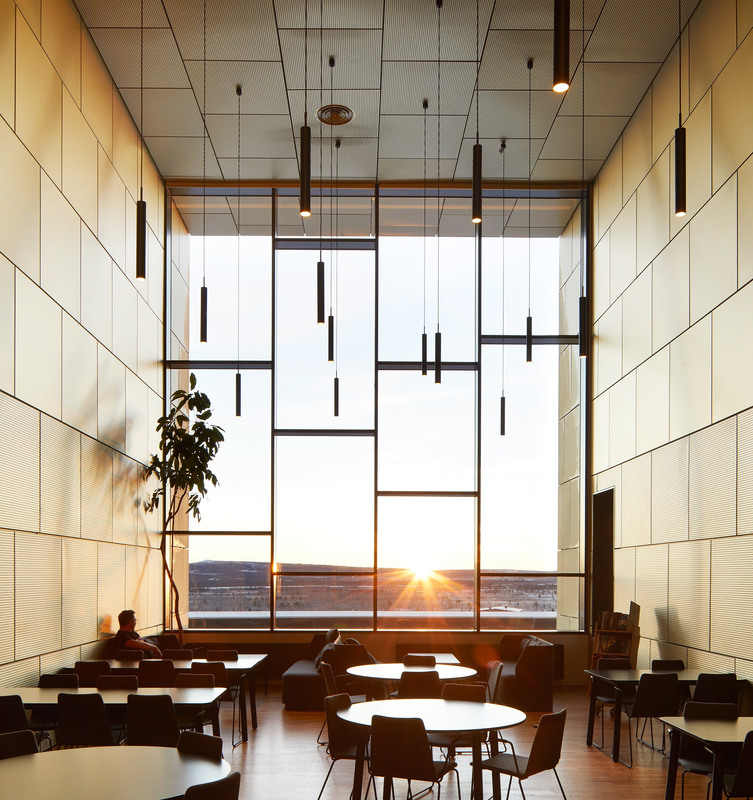 Henning Larsen designed the circular town hall to become the administrative and cultural centre of Kiruna, which is being moved three kilometres east, as it is slowly being swallowed by an underground mine. 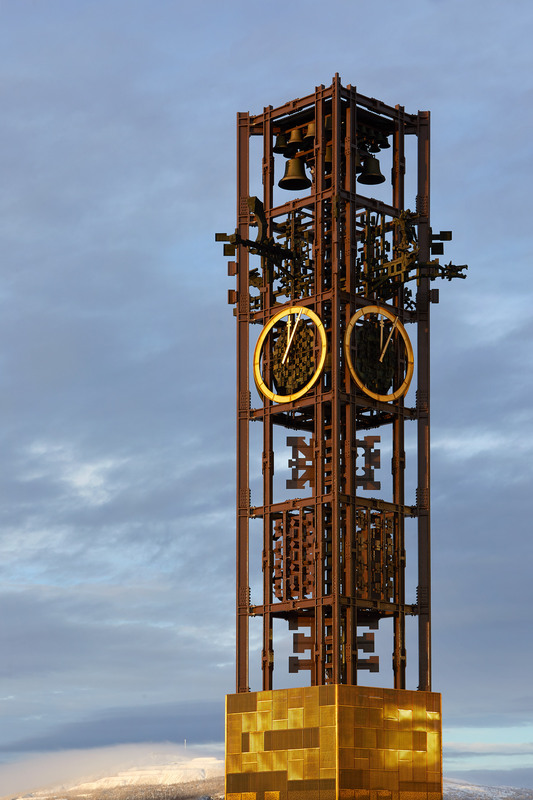 Located 95 miles north of the Arctic Circle, the town of Kiruna exists due to its close proximity to the largest iron ore mine on the planet. However the extensive mining is now destroying the town. The mine’s shafts, which extend 1,365 meters beneath the surface, have begun causing sinkholes and rifts that are predicted to collapse the site of the existing town within the century. In response to this threat, the state-owned mining company Luossavaara-Kiirunavaara (LKAB) is relocating the town and its 18,000 population, at an estimated cost of £1 billion. LKAB plans to relocate 21 existing significant buildings from the old town of Kiruna, including its church, which was voted Sweden’s most beautiful building. The majority of the rest of the town will be reconstructed from scratch. Officially named the Crystal, Henning Larsen’s town hall, which opened today, is the first stage in this remarkable relocation plan. It has been designed to become a recognisable heart and natural gathering place for the new town. 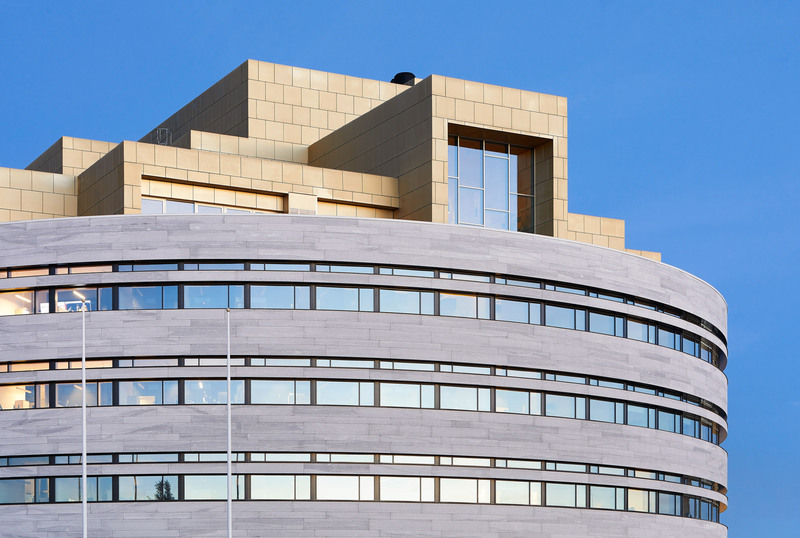 “The idea of the building is that it is the cornerstone of the town’s new identity,” explained Louis Becker, partner and design principal at Henning Larsen. 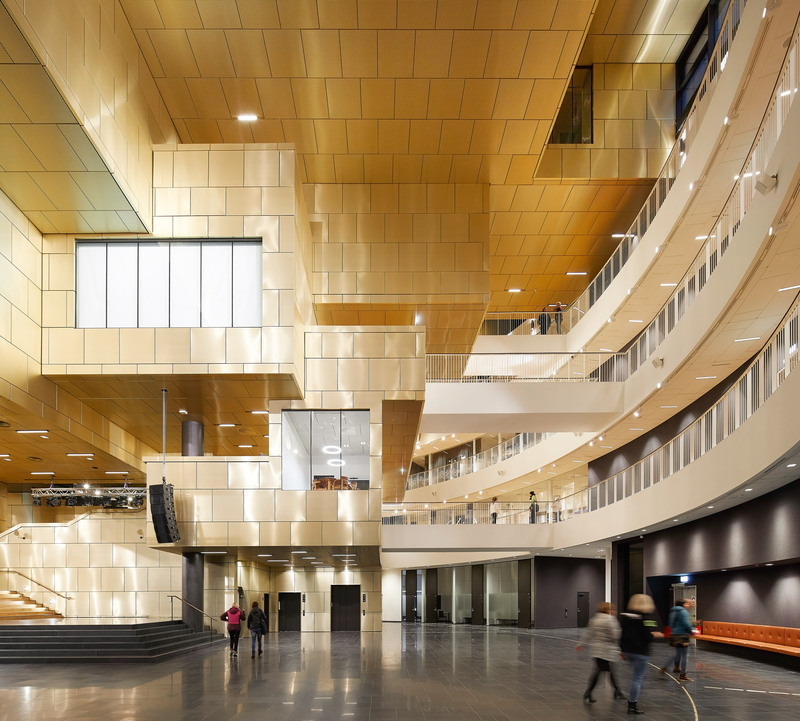 “It is the first building and also the largest public building so it needs to do the job where it is visually recognised – this is why we have the golden volumes sticking out of the roof,” he told Dezeen. 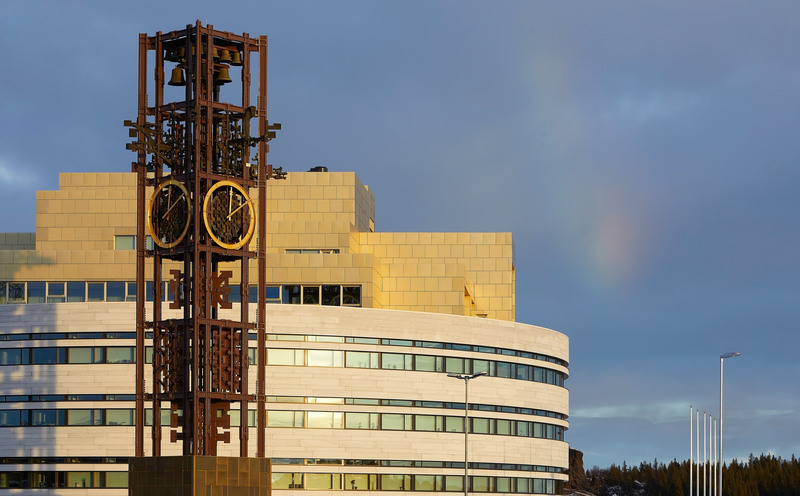 To physically and visually connect the new building with the town’s past, the clock tower from Kiruna’s old town hall – designed in 1958 by Artur von Schmalensee – has been dismantled and rebuilt alongside the new town hall. The original door handles from the main entrance of the Von Schmalensee-designed building have also been incorporated into the new building. “Community identity often has real geographic roots. We knew that during Kiruna’s relocation, losing a sense of place could be a major challenge to the town’s residents, ” said Becker. 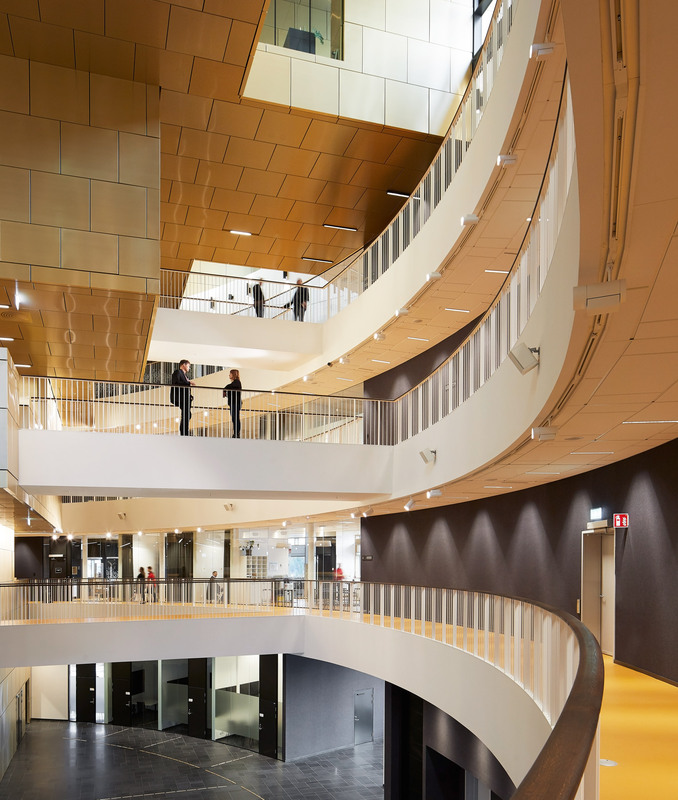 The Crystal is designed as a circular ring of offices surrounding the stack of golden cubes, which are inspired by the iron ore beneath the town. 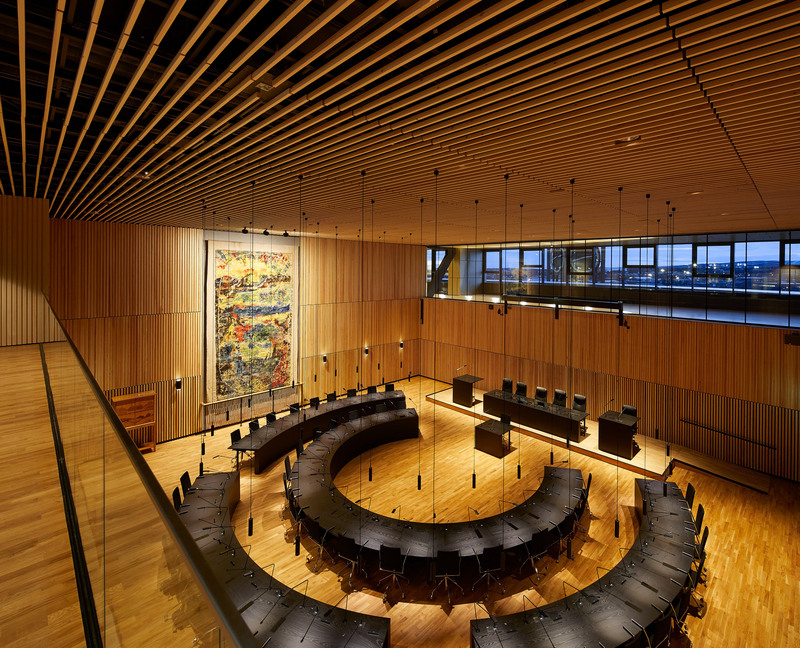 The stacked volumes within the ring of offices contain Kiruna’s council chamber, as well a public gallery that displays contemporary art from the Artic region. “It is symbolic. If you put the chamber and art gallery at the centre you emphasise that democracy, culture and people’s involvement – that is what’s important. It’s not to move papers around,” said Becker. 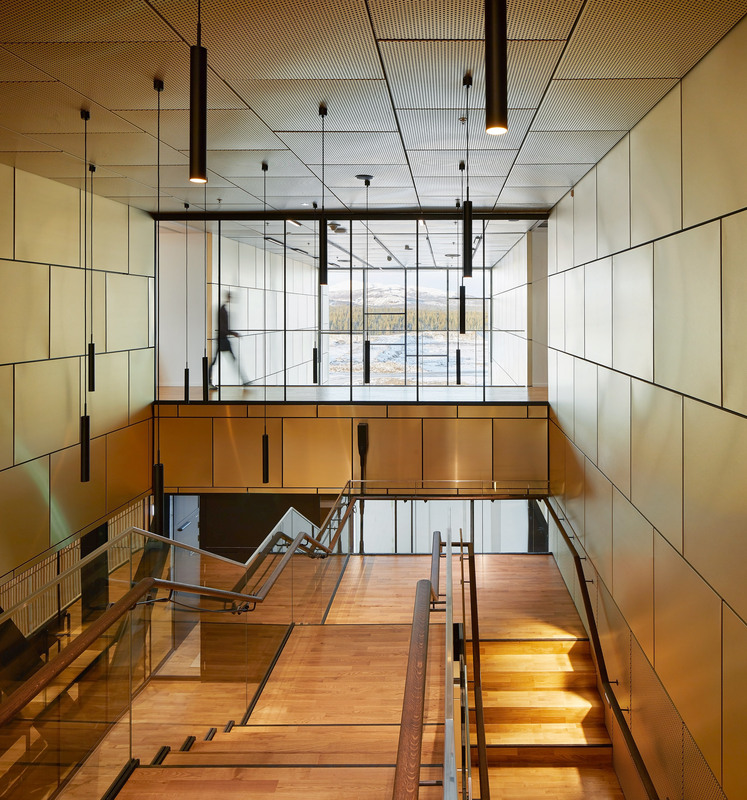 To achieve its public function, the building’s entrance leads directly to a large open foyer containing a public restaurant, with no barriers – meaning that the public has access to the entire building, with the exceptions of the offices and the chamber. “On the inside there is a large inviting space that can be used in different ways, instead of a barrier or front counter,” continued Becker. This is the 10th town hall building that Henning Larsen has completed, according to Becker, following the much smaller Eysturkommuna Town Hall in the Faroe Islands. The studio has been refining the typology each time, to make the building more democratic. “Families are coming in with kids, they had a coffee and met the mayor by coincidence. All the things we dreamt of are happening here,” he said. Following the town hall, it is expected that around 3,000 buildings will be constructed or relocated to the new town. The majority of the work is due to be complete by 2040, with the Crystal at the new community’s centre. “Its a sense of place project. It is much more than a building,” concluded Becker. Photography is by Hufton + Crow, except main image and where stated by Peter Rosén.